Here are some of my own festive nail tip ideas :) They are simple to do and don’t look as overwhelming as the whole nail being done. All polish used was Barry M as they have lang lasting polish with strong colour, links to the ones used are below. I love my nail foil tape, it was 86p on Amazon and although it took a long time to arrive it was worth the wait. It is such an effective way to add glam to your nails and make them look expensive if used sparingly. I always use a long strip, place in the middle and push to the edges and then cut off the excess. I also love nail caviar. Mine was from Ebay for £1.99 for 12 little bottles and lasts a long time. Just paint your nail where you want them in a light colour and sprinkle over to create the snowball effect like I have. 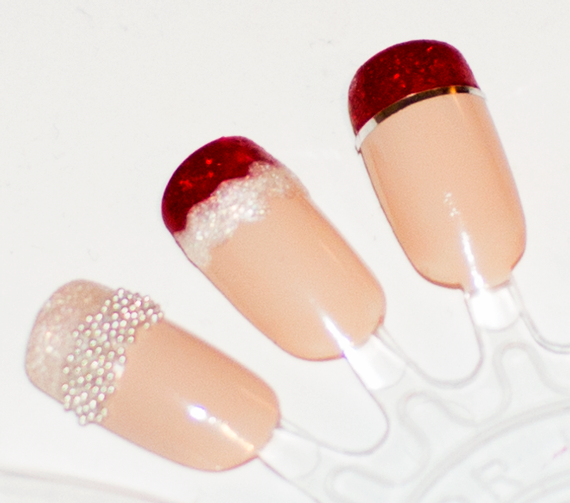 The santa hat nail was done by blobbing on Barry M Textured Nail Paint White Pearl Lady with the nail polish brush, although if you struggle I suggest doing this with a nail dotter.